Social workers operating in the child, family, and school segments of the industry can end up taking on a variety of roles during their professional lives. The job can lead to employment in a wide range of settings, such as work centered on helping families deal with a diverse array of challenges or even community leadership roles focused on advocating for at-risk groups in family or school settings. With so much opportunity, it can be difficult to pin down the right opportunity for you. With this in mind, here’s a closer look at the sector to help you identify if it’s a fit for you as you pursue higher-level positions in the social work industry. Child, family, and school social workers advocate for the well-being of children by helping create and support healthy and caring environments. This can involve working in a school to meet the needs of a student with a disability, helping individuals suffering as a result of bullying, or educating teachers on how to support students who don’t fit in socially. 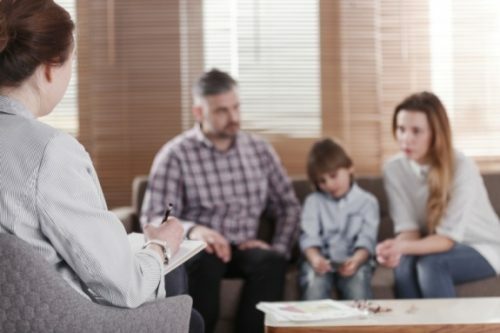 In a family-focused practice, work can incorporate connecting children with foster care, protecting individuals from abusive situations, and helping families identify community resources that can assist them in a variety of circumstances. Protecting individuals from intimate-partner violence and domestic abuse is a central component of social work in the child, family, and school segment. A study from the National Association of Social Workers explained that unpacking the complex conditions related to domestic violence can be difficult, but failing to do so can lead to compounding challenges, as physical abuse is often accompanied by emotional and sexual abuse. According to the report, ecological models for preventing abuse are more prevalent, as the concept seeks to account for a wide range of conditions that contribute to abuse, including individual, relationship, community, and societal factors. By analyzing each of these components of a community’s ecosystem, social workers can better understand the cause of abuse and take action to prevent it. Approximately 76,480 social workers practice in individual and family services settings, making it the largest single destination for child, family, and school social workers. Another 63,100 child, family, and school social workers operate in state government settings, not including schools and hospitals. Local government is the next largest market for these professionals, as local public sector organizations excluding schools and hospitals employ 54,450 social workers. Almost 40,000 child, family, and school social workers practice in elementary and secondary schools. Care centers classified as “other residential care facilities” round out the most prominent places to work, providing employment for 9,670 child, family, and school social workers. Encouraging social workers to stick to the NASW Code of Ethics as a guiding force in their decision-making, but doing so in light of the unique challenges that come with working in school settings. Ensuring social workers blend knowledge of general social work best practices with a specific awareness of how the local school system functions. The NASW mandates professionals have at least a master’s degree in social work from an accredited institution, with the MSW as the recommended entry-level degree. Expecting school social workers to perform systemic assessment, data gathering, and subsequent analysis of individuals, families, and organizational systems to create better social environments. This list doesn’t encompass all of the expectations of school social workers, but these few key points highlight the complexity of the role and importance of advanced skills. This segment incorporates a wide array of social work goals. As such, salary and job growth projections should vary. According to the BLS, social workers in general can expect new jobs to be created at a 16 percent growth rate from 2016 to 2026, which is more than double the national average. The median salary for social workers was $47,980 in 2017. The job growth projection for child, family, and school social workers is a 14 percent jump by 2026, and the BLS estimated that median wages in this segment are slightly higher than the social worker sector as a whole, with average pay coming in at $48,430. Pursuing an online MSW can help you advance to the next stage of your social work career. If child, family, and school social work sounds like a fit for you, contact Regis College, and we can connect you with an enrollment counselor to discuss our program and how it may help you achieve your goals.